This collection consists of the records produced and maintained by Stephen Pifer, who served in the National Security Council’s (NSC) Russia, Ukraine, and Eurasian Affairs Directorate from 1994 through 1997. 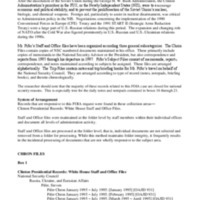 These files contain memorandums, correspondence, reports, notes, and briefing materials regarding his work on Clinton Administration policy toward the former Soviet Union. Topics include economic and political stability, the Conventional Forces in Europe and the START II treaties, foreign aid, and NATO expansion. The collection also contains notes and briefing books for Mr. Pifer’s travel on behalf of the National Security Council.